Hawaii is bracing Sunday for another foot of snow, in addition to the 2 feet that landed on the island’s highest mountain peaks since Thursday, The Weather Channel reported. The snow is falling on the peaks of the Big Island of Hawaii, including Mauna Loa and Mauna Kea, and the National Weather Service has issued a winter storm warning for the area through late Sunday night. The storm warning stated that an extra 6 to 12 inches of the white stuff may land above 11,000 feet, and winds could reach 15 to 30 mph. The snow, which has been falling since late last week on the Big Island’s volcanic summits, forced officials to close a section of Hawaii Volcanoes National Park. Fog, heavy snow and icy conditions also forced the closing of the road up to the Mauna Kea visitor station. A flood watch has been issued through Sunday afternoon for the rest of the Hawaiian Islands. Skiers can take turns driving, picking up other skiers at the bottom of the runs and transporting them back up to the summit. 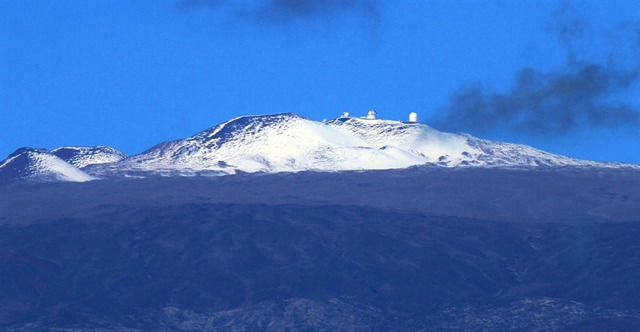 There has been 30 to 36 inches in recent winters, according to Ryan Lyman, forecast meteorologist with the Mauna Kea Weather Center.